Whether due to a continuous repeated movement or a singular traumatic event, damage was incurred and now you’re injured. So what do you do? For one, it is always beneficial to check in with a health care professional who is well-versed in physiology and rehabilitative exercises such as a physical therapist or chiropractor, sports trainer or exercise therapist. First, let’s go over some basics. Ligaments, Tendons, Muscle and Fascia. Generally speaking, a ligament is connective tissue that adheres bone to bone. Tendon is similarly designed, but is a conduit between muscle and bone. Fascia is connective tissue that surrounds muscle and organ tissue, like saran wrap. When damage occurs, fibers become disrupted (think of a rope that has been frayed). When chronic or repetitive movements (or past injuries that healed improperly) occur, these layers become disorganized and can ‘adhere’ to surrounding tissues. When this occurs, the body lays down inflammatory markers to try and remedy the situation, usually in the form of scar tissue. These adhesions often reduce range of motion, or produce varied levels of pain during active or passive movement. These adhesions and their scar tissue counterparts also contained additional nerve impulses, or nocioceptors that heighten sensitivity making the athlete more aware of the sensation of pain. Is it tendinitis or tendinopathy (tendinosis) that you are dealing with? 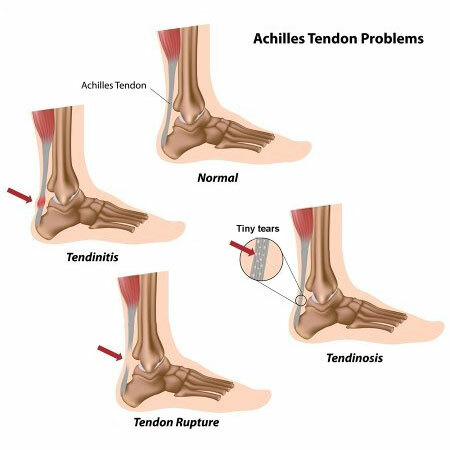 A tendinitis injury is often an acute-level injury in which inflammatory cascades are activated reacting to damage to a muscle or tendon. A tendinosis injury differs in that it is a slightly-older injury that has been long-standing (i.e. gone untreated) or one that has been poorly rehabilitated and healed improperly. These injuries often are accompanied by reduced vascular supply (hypoxia), increased sensitivity, and disrupted tissue organization (i.e. collagen fiber separation). Treatment Protocol: Injection, NSAID’s, Exercise Strengthening or Rehabilitation? There is and has been for a while a faulty logic among practitioners who were taught that patients presenting with an acute tendonitis injury, or overuse tendonitis (or, borderline tendinosis) injury is an injury that has an inflammatory component and as such, requires an anti-inflammatory solution such as medication or injection. Research shows that patients who underwent surgery for tendon pain revealed (under light microscopy) tissues that were thinned, frayed, and showed collagen separation length-wise as well as cross-sectional – and the kicker – that classic inflammatory markers were absent. These points to a tendinosis injury, not a tendinitis injury. It should be further noted that, in animal studies using rabbits, mechanically induced injury (electric stimulation of muscle tissue through the use of surface electrodes) showed tendinosis presentation within 2-3 weeks – with the absence of classic inflammatory markers. This then begs the question – if there are no inflammatory markers present, and I’m given the option of taking OTC pain medication or a localized injection – both are anti-inflammatory – will they work? The answer is not really. Meta-analysis by Khan et al. (2002), revealed mixed results with pain relief using corticosteroids; while anti-inflammatory medication showed limited evidence through short-term usage and no effective evidence through medium-term usage of soft-tissue conditions. So, if the likes of orthopedic surgeons and medical practitioners can shift their focus from the over-use term of tendonitis, and instead consider tendinosis as a more relevant diagnosis, then more effective treatment protocols will surely follow suit – and the use of anti-inflammatory treatment and corticosteroid injections will be replaced by the more-effective rehabilitation protocols. The main concern for any athlete or weekend warrior is: how long will this take? Any athlete that discovers that their injury can take weeks to months to get better will look at you like you have three heads and often opt for the medical route. But, as we have just described, medication is at best minimally effective – so they will end up in a rehabilitative clinic shortly after they discover ‘the shot / pills didn’t work’. It all comes down to patient education. When practitioners treat conditions involving the musculoskeletal system, ensuring the patient has clearly understood their condition and understands there is a time constraint on healing (i.e. allowing sufficient time for collagen fibers to heal and allow tissue remodeling to occur); then the frustration will be ameliorated and the patient’s commitment to healing should improve. After all, the more you get on board, the quicker turn-around and return to exercise or sport you will have. *Always consult a health care professional before beginning any rehabilitative protocol. I have used this exercise in my office in conjunction with chiropractic care as well as active release technique on multiple cases with a high degree of success. 1. Khan, K. et. al (2002). Time to abandon the ‘tendinitis’ myth: Time to abandon the “tendinitis” myth: Painful, overuse tendon conditions have a non-inflammatory pathology. BMJ. 324(7338): 626–627. 2. Alfredson, H., & Cook, J. (2007). A treatment algorithm for managing Achilles Tendinopathy: new treatment options. British Journal of Sports Medicine. 41(4): 211-16.